Viscosity is one of the most important material properties of any fluid, characterizing its resistance to flow (or more technically, its response to shear stresses). We’re intuitively familiar with viscosity, observing for example how warm honey flows much more easily than cold honey. For water, oils, and many other three-dimensional fluids, viscosity is well-characterized, tabulated in books and databases. 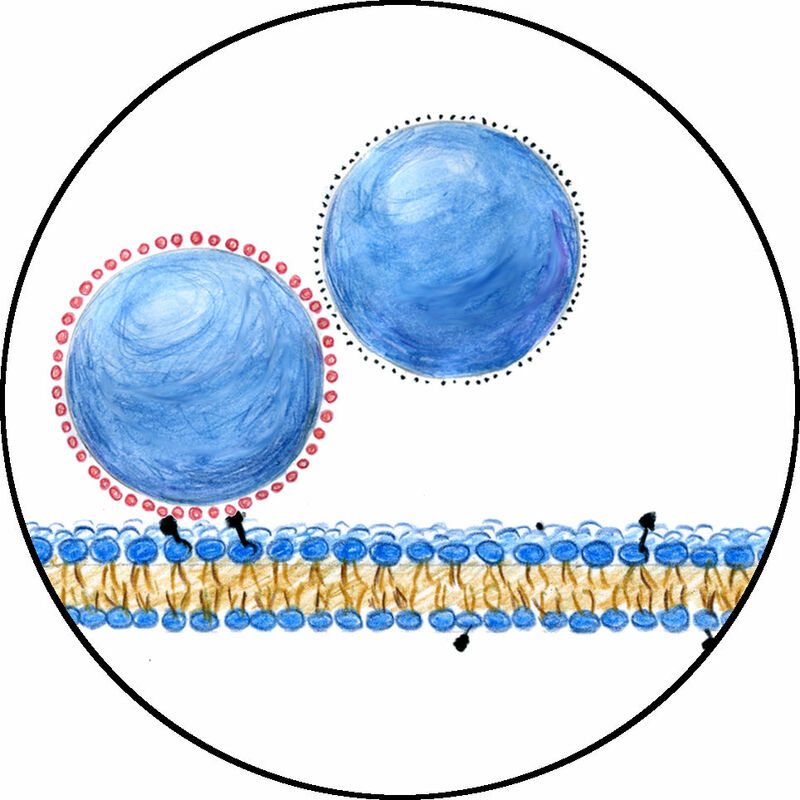 For lipid bilayers, however, the two-molecule-thick liquids (illustrated above) that make up cellular membranes, viscosity is poorly quantified. It’s hard to measure, especially because lipid membranes are essentially two-dimensional fluids, whose flow behaviors differ quite dramatically from their three-dimensional counterparts. Understanding lipid viscosity is important for understanding how structures in membranes like protein clusters and cholesterol-rich “rafts” move, how proteins can alter the fluid properties of membranes, etc. In addition, it’s just embarrassing that the state of our understanding of the lipid bilayer, nature’s most important two-dimensional fluid, lags so far behind that of three-dimensional fluids. On the left, the effective size of the diffusing object is bigger than the particle size; on the right, it’s smaller. Using this approach, we were able to measure lipid bilayer viscosity. Moreover, we were able to study what happens when a protein that’s involved in membrane deformation interacts with the lipid bilayer, discovering that it dramatically increases the two-dimensional viscosity — the first time such an effect has been reported. We were very happy with how this project turned out. It was also gratifying to see that others liked it — it got chosen for a “synopsis” from the American Physical Society, one of just six for the week, and was also featured in a “research highlights” blurb in Nature Chemical Biology (?!). By a great coincidence, a paper on granular materials from my neighbor Eric Corwin also got a synopsis in the same week! Tristan Hormel, the first author on our paper, is a graduate student in my lab, working now on a very different (and better?!) way of revealing fluid properties of lipid membranes. Sarah Kurihara, the second author, was an excellent UO undergrad biology major; she’s now doing fascinating things as a Peace Corps volunteer in Lesotho. Her blog is here: http://sarahkurihara.wordpress.com/. (I recommend it.) Katy Brennan and Matt Wozniak were great summer undergrads in the lab, here as part of a REU (Research Experiences for Undergraduates) program. As mentioned, we’re continuing to explore the fascinating fluid dynamics of lipid membranes. We’re also using particle motions to examine viscosity in other contexts, for example inside fish guts (really), which I’ll hopefully write about in the future.